Acne Scarring comes in all shapes and sizes and is a common side effect of many varieties of acne. Most Acne scars fall under one of the following 4 categories. Previously, potent chemical peels and retinoids were the number one choice for acne scar removal and, until recently, had one of the higher success rates for any medical facial procedure. 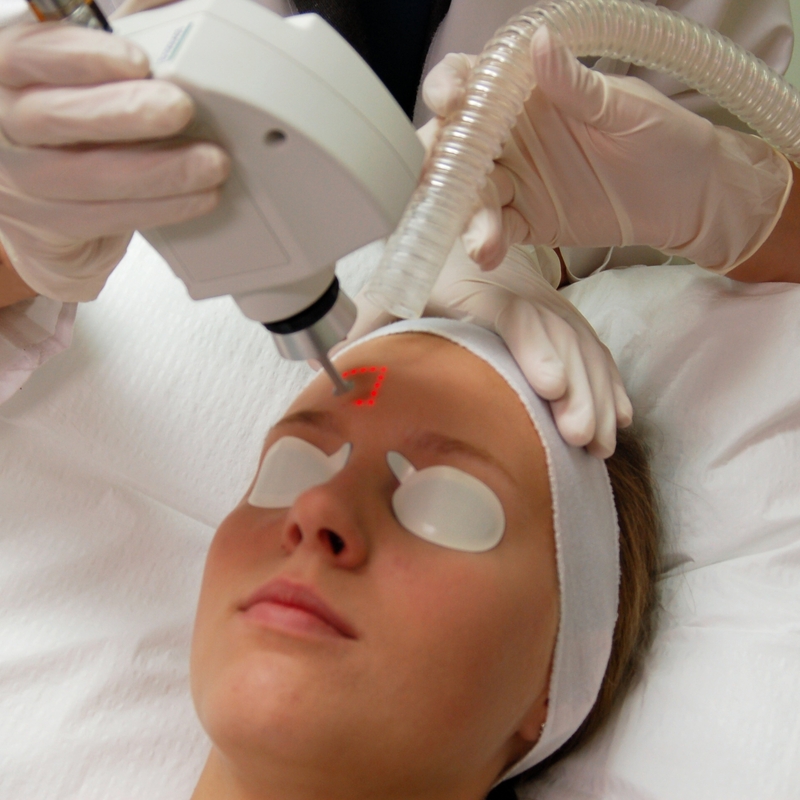 However, laser techniques have quickly became welcomed as the go-to procedure for acne scar removal because of the control and precision doctors held when using the instruments. You can be in and out of the office within 30 minutes with substantial layers of damaged skin removed from your face. –Erbium (ER) or YAG: YAG lasers use precise wavelengths and the moisture content in the skin to penetrate and be absorbed into the problem area. –Carbon Dioxide (CO2) lasers are relatively new in the skin surgery industry and patients must meet specific requirements in order to qualify for the procedure. It emits short bursts of extremely high-energy, highly focused laser light that vaporizes the scarred tissue layer by layer. -Cost: These procedures each cost $3000-$6000… per treatment! –Burning: Because these are high-energy lasers they have been known to cause burning on the skin. This results in many side effects such as crusting, oozing, infections, swelling, cysts, and dilated blood vessels immediately after treatment. –Hyper/Hypo pigmentation: If the laser is not used perfectly (and even if it is) some skin is more sensitive to others and may develop an uneven skin tone in the areas surrounding the lasers path. This discoloration leaves the skin lighter/darker then the skin around it and appears blotchy, sometimes more unsightly then the acne scars themselves. –Textures: Post surgery can have many surprises in regards to your skins texture and appearance. Common side effects of laser treatments include eczema, acne, cysts, and sagging of the skin due to inconsistent application of lasers. These effects often leave your skin in worse condition then when you went in. –Not addressing the underlying cause: The concept of laser acne removal is, at its core, only a cover up of any underlying issue that may be causing your acne in the first place. It is important to find and address the issue before even considering a procedure of this kind (in fact, non-active acne is a requirement for laser acne scar removal anyway). We recommend exhausting every other option first before spending the money on and taking the risk of a laser treatment. Glycolic acid and microdermabrasion can help renew damaged skin very effectively when done right. Skin Eraser serum works to make acne scars appear lighter and less visible, diminish minor imperfections, minimize the appearance of wrinkles, and even out skin pigment and tone. Want better news? This kit is only $59.99. Less downtime, no risks, and 20+ treatments for your scarring and imperfections. As for the problem of underlying causes, ZENMED offers its famous Derma Cleanse system with Derma Cleans Capsules. This herbal formulation helps promote a healthier complexion from within based on Ayurvedic and Traditional Chinese Medicine principles by aiding with the body’s natural elimination processes. Acne scarring happens to the best of us, but it doesn’t have to be permanent. And it certainly doesn’t have to be costly. Check out ZENMED for some inexpensive and safe alternatives to Laser Acne Scar Removal and pricey professional chemical peels. Alternative treatments more often than not also works like conventional medicine. they are even safer and cheaper too. “,:..
Acne scars are no fun…Korean Red Ginseng works awesome for clearing acne scars! That was a very engrossing segment you’ve cited. Laser scar treatments are very effective at reducing the appearance of the scars. I had it done a month back from Fairview Laser Dermatology clinic in Toronto. It’s not that expensive as you’ve cited above. I had severe acne on my cheeks since my teenage and now I’m 23. It took only 5 procedures to achieve a good effect. At the very first week my face turned red and it hurt a bit, but it was bearable and in a few minutes it came back to the normal color. I can see the difference. Before all of this treatment I had big red spots, and now they are becoming smaller and lighter. Thanks for sharing the wonderful Article………. This was a wonderful informative post you shared on this page with the outstanding steps to destroy the black moles from face naturally at home from the Sensitive skin of hand in a seven days by using the hemp seed oil daily according to the period of a time after the recommendations of a doctor to get spotless skin with the usage of skin care products and remember the instructions of a doctor. I have enjoyed reading this wonderful article about laser acne scar removal. Really, entire discussion is more helpful and all the tips are more effective too. I am very glad to go through this kind of helpful article. Thanks for sharing a nice article.